Expected: 51'25" + 2 commercial breaks of 2.35 each. Actual running time with bumpers: 51'31"
The bumpers between the acts are generally 10 seconds from fade in to the "End of Act" bumper to the end of audio before the commercial, a 10 second still without audio, then cut to the next act bumper. This would play with the theme for around 10 seconds. Accordingly, with the episodes being in 3 acts, the running time of the action is approximately a minute less than listed above, minus the opening and closing credits (normally 0'16", with a 2" fade, and anywhere from 0'41" to 1'20", hard cut or 1" fade or mix, respectively). 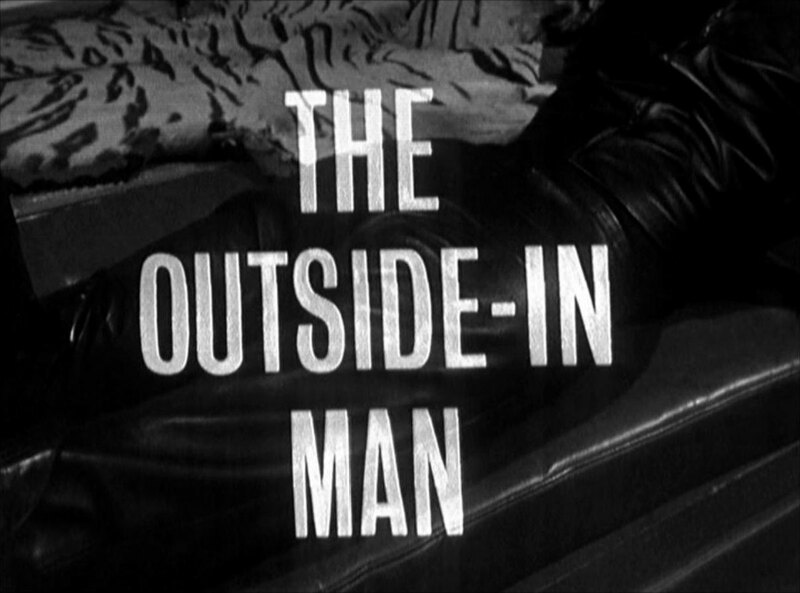 This episode was already scheduled to be broadcast, ten days later, while it was being produced. 3 booms, fishpole for Ext. Butoher's Shop, slung mic. in Steed's Hall, grams, tape, pract. intercom. between Quilpie's Office & Outer Office, 3 pract. telephones in Quilpie's Office, Steed's Flat & Gentlemen's Club (to ring only). FX bell box. ABC symbol + "Avengers" opening titles (sof), 1 stock sof sequence (35mm. ), 1 slide and caption scanner. 3 Pre-VTR inserts in Aot 3. Debris on 5' rostrum, 3 pedestals. 2 booms. Echo, grams & tape. 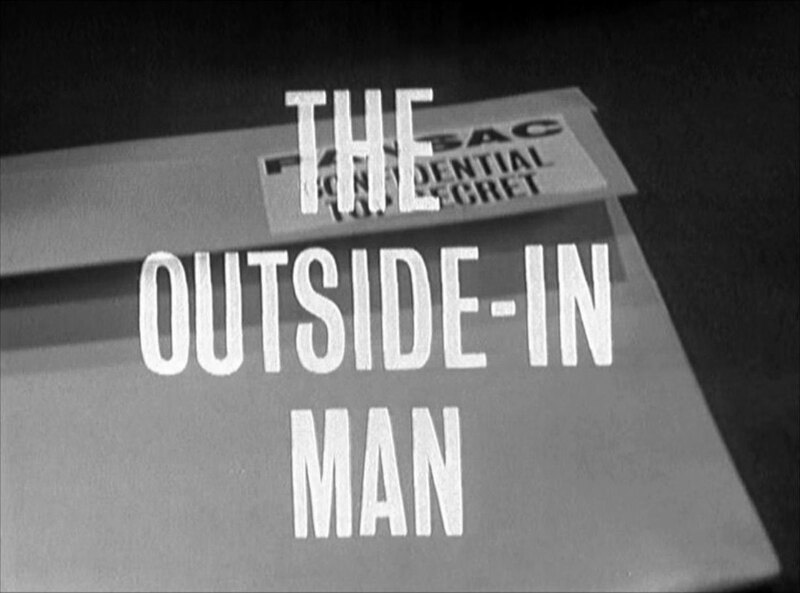 0:00 - the ident for ABC changes with this episode, with blockier text and the disappearance of the arrows. 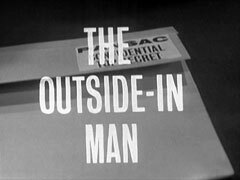 1:20 - the confidential dossier on Quilpie's desk which he hands to Steed is labelled "PANSAC - Confidential Top Secret" We learn later (22:25) that PANSAC is the Permanent Agency for National Security And Counter-intelligence. 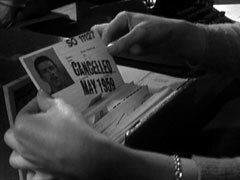 3:20 - Steed tells Cathy that the British have tried to kill Sharp several times, losing a few agents in the process: Steve Rayner, missing presumed dead, Mark Charter, killed on operations. 3:50 - Charter's number is SO 11127 - it was cancelled in May 1959. 6:20 - Charter asks for five years back-pay and says he'll settle for a round figure of £15,000. 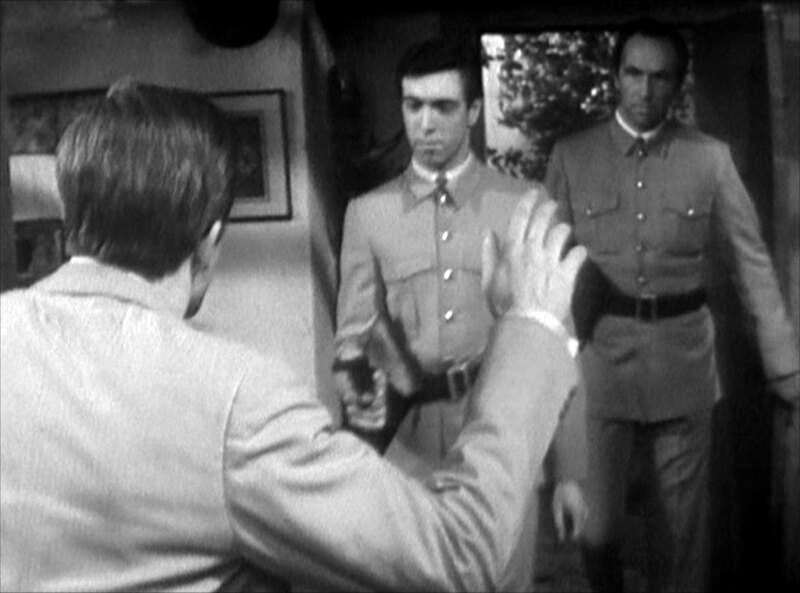 6:30, 13:15 - There's a humorous undercurrent throughout the episode with Edwards being irate about Charter's chair at Beadle's club; he's quite irate when he discovers that it's Mr Charter's chair by the fireplace that he's had the use of for the last five years, and upon hearing Charter will be away a few days (13:15), he tries to resume his chair, but Jenkins' stern gaze stops him. 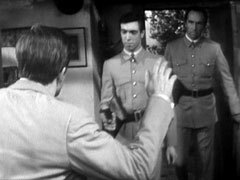 Later, he draws Jenkins' attention to the newspaper article mentioning Charter's disappearance, commenting it's a waste of a perfectly good chair when Jenkins tells him, "Yes sir, Mr Charter told me he'd be in the country for a few days." 11:30 - Cathy sells her convertible to Chart for £500. 13:40 - small smudge top centre of camera 2's lens (shobt 98 is dropped at this point, and the scene starts with camera 2 rather than camera 4). 14:05 - Ronald Radd call Quilpie's secretary Alison instead of Alice. 14:07 - there's a dark spot right on the edge of camera 2's lens at centre top in Quilpie's CU. 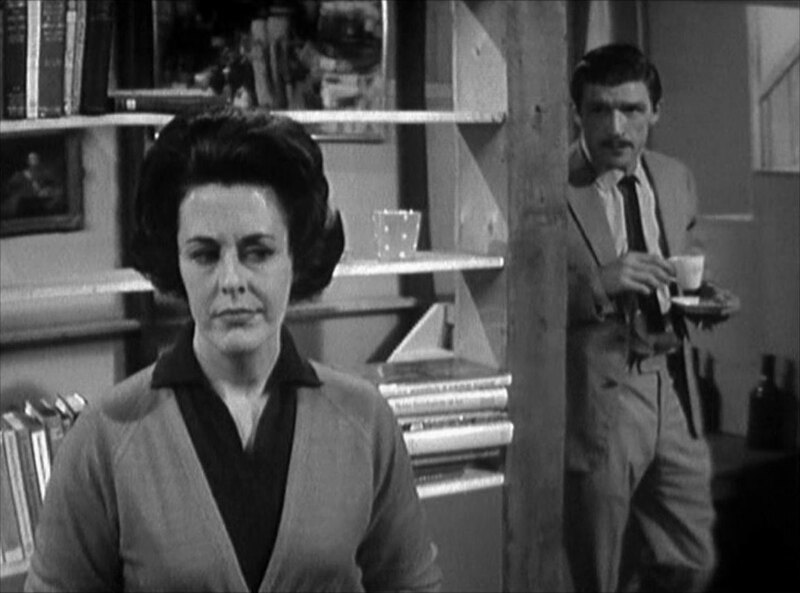 It's less distinct and further from the edge at 14:14 in the 2-shot of Steed and Quilpie. Returns at 24:05. and 42:16. 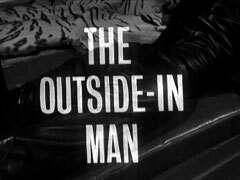 18:35 - Steed answers the door to Cathy and returns to the phone. Finding Quilpie has put it down, he starts whistling into the phone which irritates Quilpie immensely. 19:20 - there's a spot on camera 1's lens almost dead centre which ruins Cathy's MCU. It's even more obvious in the LS at 20:20 as they leave the flat. It returns at 25:13 when Cathy is talking to Zulficar. And at 31:30 in the club. 38:50 at embassy. 41:52 Quilpie's office. 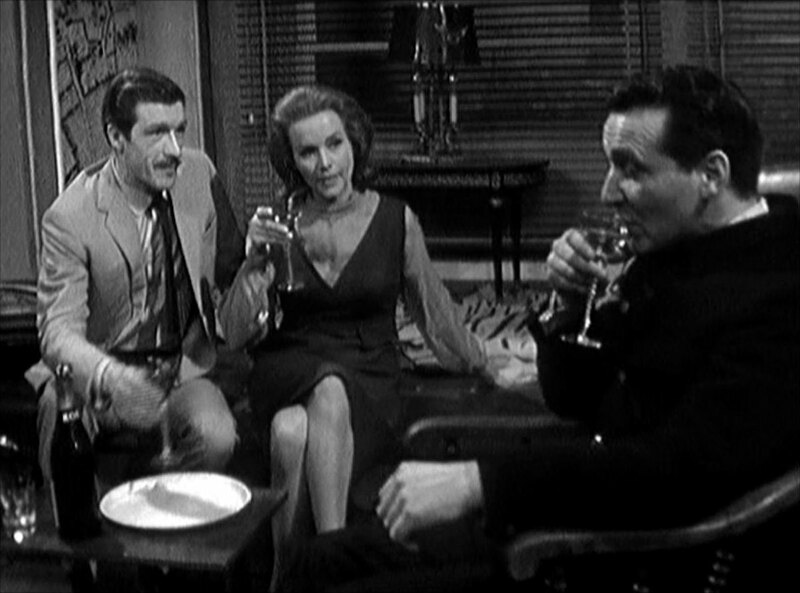 23:00 - Steed tells the aptly-named Miss Brisket, "Mrs Gale is a vegetarian," and she replies, "Oh dear!" 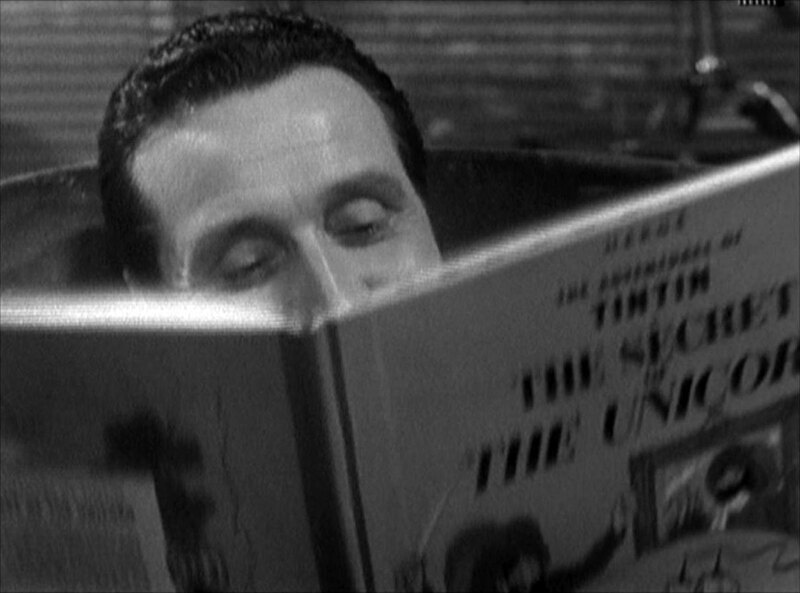 Steed adds, "The delights of modern butchery have little appeal for her" (dropping the first half of his line). 26:30 - Another opportunity to show naked women on Sixties television is not missed - Lynden's garage has six pinups around an official notice. 28:40 - Lynden's garage was at 4 Chepstone Mews. 32:30 - Yet another Tintin reference - in this episode, Steed prefers to read "The Secret of the Unicorn" rather than answer Mrs Gale's 'phone call (even chuckling to himself and saying 'Blistering Barnacles!' sotto voce). 33:17 - Helen's cottage is Hazel Cottage, near Selsey, SusSeX. 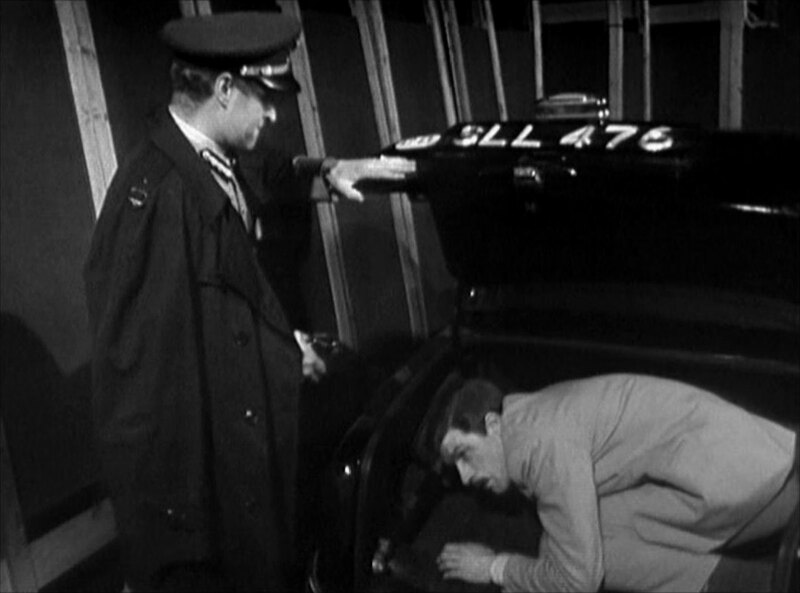 39:15-39:30 - telecine insert - T/C (B) - of BOAC landing. 39:35 - you can see the lenses of camera 3, tracked in on the ambassador, when the vision switches to camera 4 for the MS of the door through which Zulficar is about to come. 43:50 etc. - Zulficar's CUs have a small hair near middle right. 45:17 - vision OOF when we return to ambassador's XCU after seeing Zulficar. 50:30 - Steed hands his package of shin bones to Cathy, who glares at him and hands them back saying, "I don't need to sharpen my teeth". A couple of cars make a rare appearance here - the embassy car, the Mini in Lynden's garage and Charter's (unseen) "Vogel Prentice" - a made-up make of car.